Foreigners meddling in our elections is A-OK as long as they're working for Democrats! On Sept. 5 2017, the Trump administration announced the end of a program that protects undocumented immigrants who arrived as children, known as DACA and started by the Obama administration in 2012. That date was crucial for Maria, a domestic worker and native of Argentina who lives in Miami-Dade and has two children, 21 and 23 years old, who are among the 800,000 beneficiaries of DACA. That’s how Maria, who arrived on a tourist visa in 2000 and overstayed it to settle in Miami because of an economic crisis in Argentina, wound up working to turn out the vote in the midterm elections. Have you ever heard a more roundabout way of saying she's an illegal immigrant? We let her in on a tourist visa and she abused our generosity and is now working to sabotage the country on behalf of a foreign power. Maria cannot vote, but has knocked on dozens of doors around Miami to urge those who can to vote. She’s part of a growing number of people who cannot vote because they are undocumented or green card holders but are hitting the streets to urge voters to cast their ballots. Their goal is to persuade voters to support candidates who promise to protect immigrants, because they understand that their future in this country is at risk and depends on those votes. Although President Donald Trump is not on the ballot, they are working to turn the midterm elections into a referendum on presidential policies and rhetoric they view as anti-immigrant. This is blatant election meddling on behalf of foreign powers seeking to open our borders, flood us with new Democrats and redistribute our wealth into their pockets. 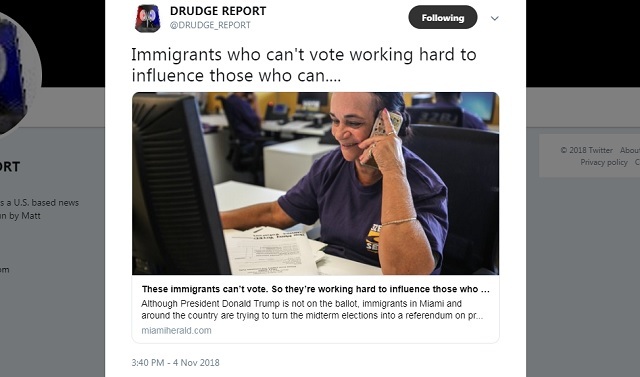 While the media hyperventilated for two years straight over Russians allegedly sharing some memes and buying some social media ads, they fully support the SEIU paying foreigners to meddle in our election on behalf of the Democrats and hail it as "progressive."